OVERLAND PARK – Environmental geology is a growing field in Kansas City, with major area construction companies, engineering firms and government agencies experiencing an increased need for geoscience professionals. It is an interdisciplinary field that addresses and studies naturally occurring and man-made environmental hazards. The KU Edwards Campus is meeting this growing need with a new, online Professional Science Master’s program with an emphasis in environmental geology. The program provides students with a combination of technical and professional skills courses targeted to their chosen field and designed to help them accurately gather and effectively communicate scientific data. Environmental geologists work both in the field and in the lab gathering data on geophysical events, performing site analysis and assessing potential geophysical impacts to the environment by development projects or waste disposal, among other duties. The results of this work are often shared in the form of reports or presentations to businesses, government officials or the public at large. Stephen Hoffine, principal at Burns & McDonnell, a Kansas City-based engineering, architecture, construction, environmental and consulting solutions firm, says education in environmental science, including geology, can lead to successful careers in a variety of fields, in Kansas City and beyond. “The strong scientific and critical thinking that comes with the geology degree lends to opportunities in many areas, including consulting, federal, state and municipal government, industry and utility companies all look for employees with that background,” Hoffine said. KU Edwards Campus Vice Chancellor David Cook said the new program’s comprehensive training approach and accessible online delivery are valuable assets in developing skilled talent for Kansas City’s workforce. 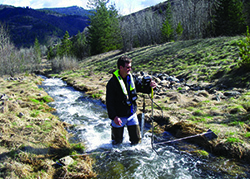 The PSM in Environmental Geology consists of 36 credit hours, with the majority of classes offered online. Three required, single-credit-hour short courses covering field and laboratory methods are taught in person at the KU Edwards Campus in Overland Park. These short courses are each designed to be completed over a single day or weekend, allowing out-of-town students to quickly complete their degree requirements. A shorter graduate certificate option is also available, consisting of 13 credit hours, which includes one in-person short course.